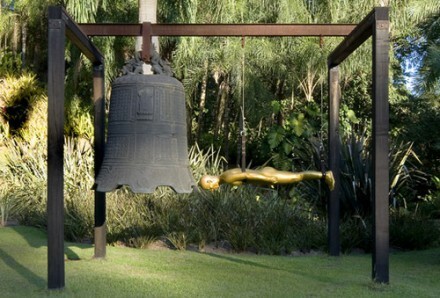 [Photo taken by the author at Instituto Inhotim, Brazil]. Our dilemma is that although industrial and agribusiness development breeds its own fear and insecurity – most of it justified – the alternatives on offer are not reassuring; they can seem too small, and too marginal, as the basis of a secure future. The growing hype about a Green Economy exemplifies this dilemma. On offer is a ‘green’ switch to renewable biomass energy as an alternative to the thermo-industrial economy. The trouble with this charming vision is that its implementation involves the biggest earth grab in 500 years – in the words of one research group “a red-hot resource grab on the lands, livelihoods, knowledge and resources of the global South, where 86% of all biomass is located“. The displacement of farmers and indigenous peoples means the loss of local and traditional knowledge, too. In practice, biomass energy production exacerbates soil erosion, drought and water shortages. On a recent visit, I learned about just such developments in Brazil. Brazil’s government believes that the country will “need” 56 percent more electricity over the next decade to power industrial development. Arguing that hydropower is the cleanest, cheapest and most dependable option, it therefore has plans for 48 large dams by 2020 to “power growth”. These large-scale projects to harness or sequester water, say opponents, will drown vast amounts of land beneath reservoirs, destroy animal habitat, take no account of the needs, traditional practices and opinions of local communities, and disregard the protection of ecosystems. Among these huge projects is a US$2 billion canal, started in 2007, to divert water from the São Francisco, the largest river to flow entirely in Brazil. Its backers say the 435-mile-long (700-km) canal will save the northeast from drought. A large opposition movement believes that the canal’s true priority is irrigation for agribusiness – especially the export of fruit, biofuels and shrimp to a fast- growing global market. The story Brazil is not unlike Iceland’s, only on a larger scale. Scared citizens are promised a future filled with prosperity and jobs as the only “serious” alternative to a marginal existence as poor farmers in a harsh climate. There is an alternative. Regional economies that support communities, respect existing ecosystems, and are nourished by local knowledge, do exist. I was especially cheered to learn about a special example during a recent visit to Brazil. A novel approach to rural development called Articulaão do Semi-Árido Brasileiro (Articulation of the semi-arid, or ASA), is being developed successfully in the north of this vast country. In this region, which is as big as Texas and California combined, and home to 22 million people, the ASA coordinates the work of some 1,000 NGOs, community and religious institutions, cooperatives, churches, and rural worker federations. The ASA’S activities are all about living in harmony with the semi-arid climate, not fighting it – and it seems to be working. It has already helped local residents build 350,000 household water tanks and 9,000 irrigation tanks – with a target of one million cisterns by 2020. The ASA programme includes a range of sustainable agro-ecological practices that are designed to coexist with climate conditions, and to respect the bioregion’s ecosystems and traditional cultures. These are based on the scale of the watershed; protect springs and riparian vegetation; and prevent pollution through wastewater treatment.Blue and green water for agriculture is curated using such proven techniques as sub-surface impoundments, supplemental irrigation, road catchments for irrigation of fruit trees, and contour plowing; furrows are used to store rainwater in situ for inter-row water harvesting.Manure and mulching are used to store water for plants. Land is managed using minimum tillage. The only crops planted are those adapted to dry climate conditions – sorghum, pigeon pea, green gram, sesame, and so on. The ASA’s showpiece is the One Million Cisterns programme which started in 1999. The use of cisterns to accumulate water from rain has been known since ancient times, including in Brazil, and the ASA’s decentralized water supply approach is based on technically simple designs. They are affordable (around U.S. $900 on average) and durable; some have been operating for 40 years or more. They can be built on all types of soil. The simplicity of the design is complemented by a participatory approach to their construction. Local craftsmen are trained to build the cisterns, and families are trained in their maintenance. 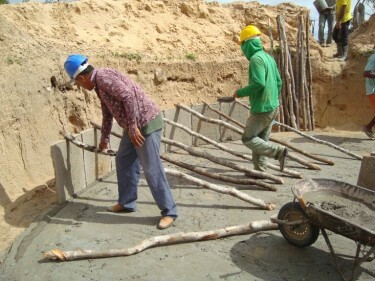 Training takes place in teams of up to ten people during the construction of one or more cisterns; each team contains at least one experienced instructor/bricklayer. Around five thousand regional bricklayers know how to build the cisterns already, and others are being trained. With these skills in place, people are able to generate income locally and pass on useful knowledge to the community. Governance is key to the success of the million cisterns project. The ASA is an umbrella organization for a wide range of stakeholders. Individual projects are implemented by ‘micro-regional management units’; each of these brings together several municipalities selected by public process.These usually collaborate with existing municipal or city councils, although the pattern varies from place to place. The ASA movement is continuously developing knowledge about how best to capture and the 750 millimeters of rain that fall on the region a year. The solution is to store water for the nearly eight months of the dry season, make optimum use of the limited supply available, and prevent evaporation. If practised wisely, this approach to water stewardship can make it possible to live and grow food in the region. On its own, the ASA cannot compete with the huge ambitions of the Green Economy – but it may not have to. Work on the canal is running years late; it was due to completed by 2010 but no finish date is yet in sight. Costs are skyrocketing, too; the project has already overshot its two billion dollar budget by 100%. Even for Brazil, an emerging economic power, the attraction of such capital-intensive projects may wane if they fail to deliver the food security and export revenues originally promised. One inriguing prospect is that the forces of Big and Small might realign. Until 2012, the varied participants in ASA were in the public sector – and all were small. But in January, Pepsico Brazil became the the first private company to join ASA. (I should declare an interest: my trip to Brazil was supported in part by an invitation to join a Pepsico executive retreat). Pepsico is a founder member of a new Business and Ecosystem Services Partnership (PESE) – a platform for Brazilian companies to “manage business risks and opportunities arising from their companies’ dependence and impact on ecosystems”. The company has also launched a $15 million fund to support water, food and education initiatives. For its critics, the PESE approach to the valuation of ecosystem services makes sense to corporations – but not to human beings. Raj Patel, for example, points out that “if one looks at the evidence, humans have in fact been rather good at protecting the environments on which they depend, without resorting to contracts and private property“. Patel charges that the accumulation of capital severs the metabolic relationship between what we take out, and what we return, to nature. “Valuing nature is fundamental to any cost/benefit approach to regulatory and other measures that incentivise sustainable practices,” he agrees, but insists that “we have to do this without transforming the natural world into the kind of entity that swiftly becomes the plaything of financial capital”. The enthusiasm of the Pepsico managers I spoke with – for small-scale farming, and the development of family agriculture – seemed to be genuine. This is not to pretend that the agribusiness agenda, with its focus on the mass cultivation of non-traditional products for export, is consistent with the ASA’s core purpose – but corporations are not immune to change. 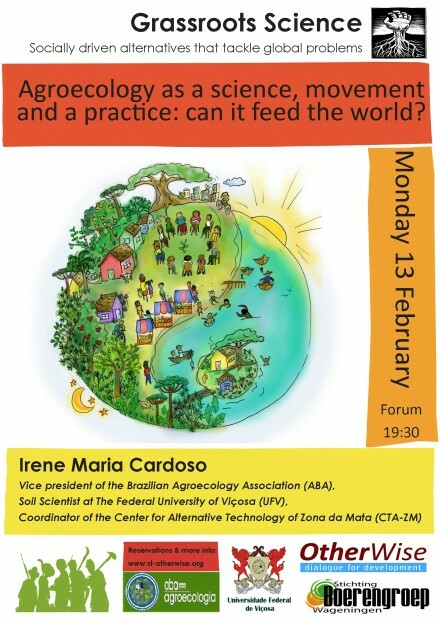 I suggested to Pepsico that a good way to confirm their commitment to ASA would be to get out of the bottled drinks business and into the supply of support services for the the emerging agroecology movement. In Brazil especially, their expertise in systems design, training, chemistry and so on, can be invaluable for the ASA’s development. I guess they’ll let me know when this has change of strategy been agreed.